I had done what I always do. 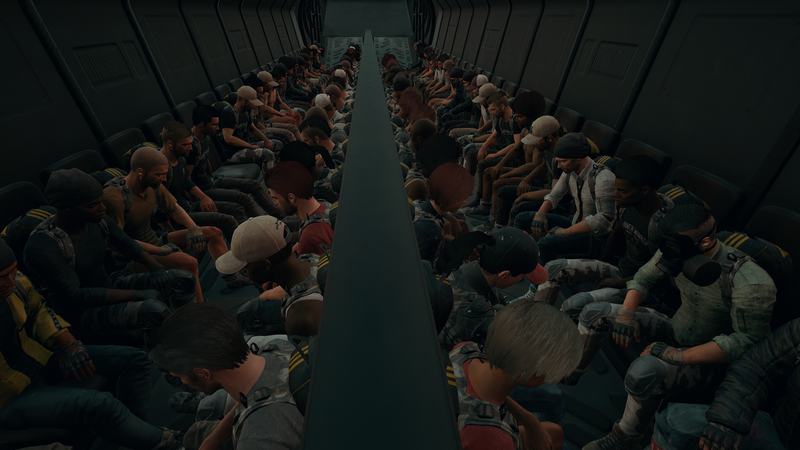 That’s how I ended up on the southern coast of Erangel, as far as it was possible to be from the randomly placed circular safe area. My only hope of reaching safety was to find a vehicle. I’d just spotted one 20 yards ahead of me by the side of a road when another player, one of the hundred people fighting to be the sole survivor on this island, sprinted past me in that same moment, heading straight for the car. 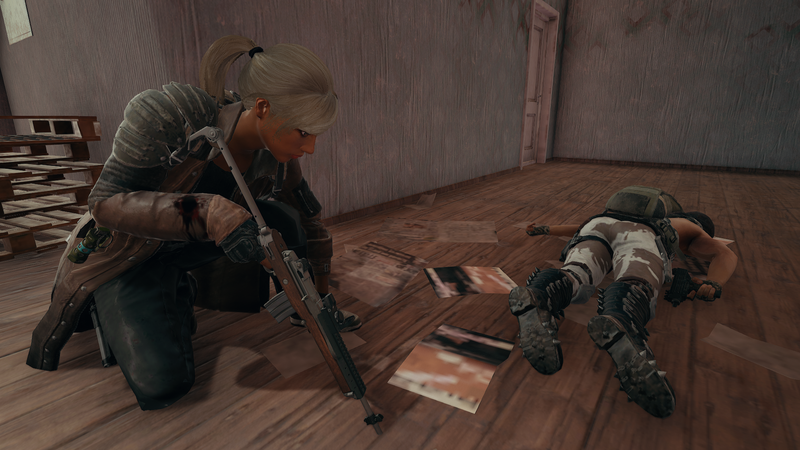 I did something I rarely do in Playerunknown’s Battlegrounds. I opened fire. Most multiplayer shooters make conflict inevitable and frequent, offering satisfaction to players solely through combat. Battlegrounds, better known as Plunkbat, stretches time and space in a way that makes combat almost optional. The game’s two maps are 8x8km, rounds take about 25 minutes, and your goal is to survive. Killing is just one possible means to that end. I have come third many times without firing a single shot. It is technically possible to win without attacking anyone, if you get absurdly lucky. This is not to say that Plunkbat encourages non-violence. Your existence in its world happens primarily through two stages: the first in which you scavenge for weapons; the second in which you use those weapons. Both of those stages, you’ll notice, involve weapons. But by giving players space, Plunkbat creates gaps between action that you can fill with two possible alternatives. If you mostly play solo, as I do, it’s tension that fills the void. This tension is familiar to anyone who has ever played the military sims that are Plunkbat’s forebears, such as Arma and its zombie spin-off DayZ. When will you meet another player? Will that other player see you? Where Battlegrounds differs is that it gives you greater control over the answers to those questions. You can choose to head straight to popular areas and fight, live or die from the game’s opening seconds, or you can parachute into the wilderness, lock yourself in a bathroom, and enjoy the thought that something could happen at any moment. The alternative is to play in groups of two, three or four and fill that space with friendly banter. For a couple of weeks last year, Adam and I conducted most of our editorial meetings while playing Battlegrounds, alternating conversation between where to go and what articles we needed to commission that week. 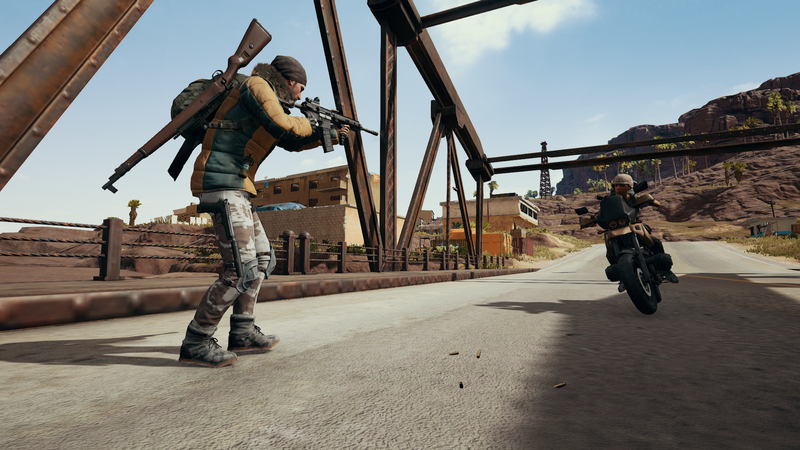 That the game supports all these experiences – quick deathmatches, tense stealth, lonely hikes and battle-bus bants – seems the key to its runaway popularity throughout its early access development. I fired once, twice, three times, and in a panic started to spray my shots. I would learn later while watching the replay that I had shot this person successfully twice, injuring them severely, but it wasn’t enough. They got in the car and raced away, crashing through fences in their rush to reach the safe zone. This left me stranded. My best hope of survival was still to follow the road, even though it took me even closer to the shimmering painwall that was already closing in. I ran as fast as I could, sloping downhill towards the bridge that connected the main island to a smaller one to the south. I knew this area well. I’d taken gunfire while driving at speed across that bridge; I’d lain prone atop the nearby hill, scoped rifle aiming down at the people below; I’d hidden and died here a dozen times. 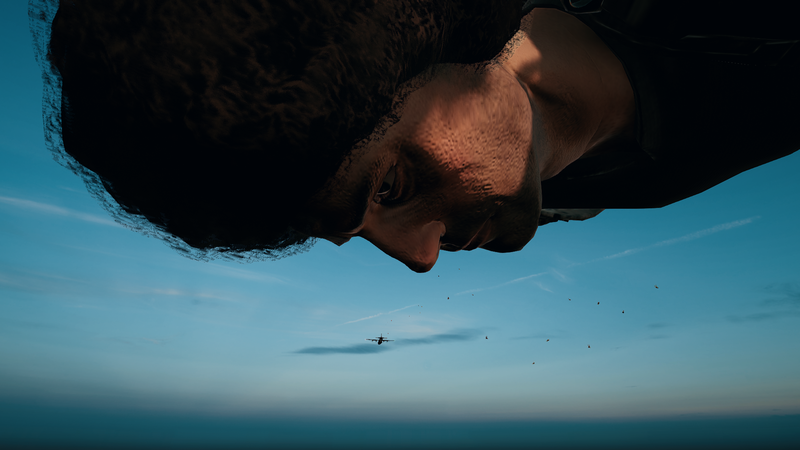 Erangel is huge, but it’s come to feel like home. Plunkbat is a systemically simple game and it’s through level design that it most shapes player behaviour. Its first (and for a long time only) map is the island of Erangel. While its fields, hills and crumbling buildings make it similar to every other survival game, it’s unusual for how many memorable locations it holds. Some of the locations are memorable for thematic and pragmatic reasons: the military base, the school and the power station hold some of the better loot and are easily recognisable. Others, however, are memorable for architectural features that give a distinct flow and feel to any conflict that happens around and within them. There is a town with a church on a small hill at its outskirts, and this higher ground feels like the focal point found in a self-contained multiplayer level. The same is true of another small town which is partly submerged in water, forcing you to reconsider the noise of your footsteps and your movement between and through its houses. I can’t remember the real names of these places – or of the maze-like underground bunker, the old ruins or of the umpteen surprisingly beautiful peaks and forests – but I know them all intimately. Just as I know this bridge. There was a car at the end of the bridge, as I was sure there would be. It was a buggy, one of the game’s fastest vehicles. I’d need to drive flat out in a straight line to reach the safe zone in time, but driving in a straight line meant driving off road, across bumpy hills and valleys that would flip my vehicle, rendering it unusuable, if I was careless. I was dead for sure if I drove slow and dead for sure if I crashed. I steered the buggy up the hill, through fences, across fields, over roads, and into the mountains. 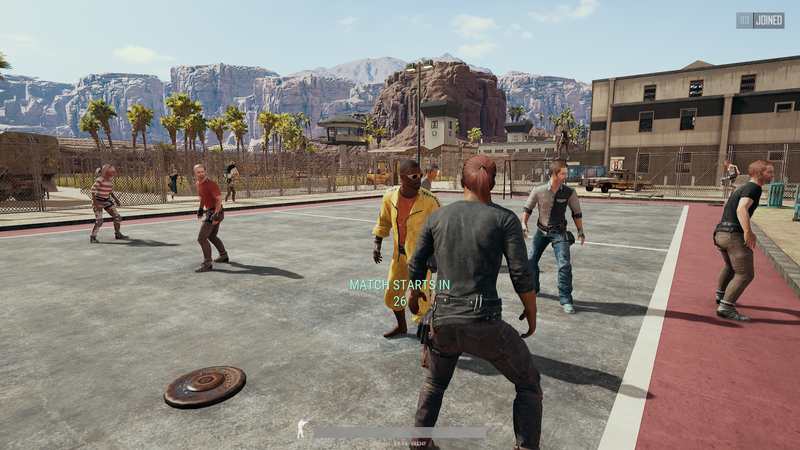 I was miles from most other players, though the replay would later show that there were a few lost souls like me. In the replay, I saw them see me, but none of them opened fire. They peered out of the windows of factories or continued their search for their own life-saving vehicle. I love these missed connections. Even as an unreformable coward, its the vehicles and weapons I find that most often define the peaks and troughs of my experience in Plunkbat. Finding a buggy or a bike early on is a wonderful rush of misguided power in most instances – power, because you’re able to speed from safe zone to safe zone, and misguided because the engine noises attract everyone to look in your direction. Sometimes you find an old beat-up Dacia or, in the desert map Miramar, a camper van. These vehicles turn your survivalist adventure from fast and furious towards doddering British comedy. The equipment can be similarly defining. Once while playing I reached a weapons cache – dropped intermittently by passing planes – and secured a powerful rifle and an 8x scope. I was overjoyed at finally being able to live out my sniper empowerment fantasies, and had a wonderful time shooting at a man who was very far away and missing seven times in a row before someone else shot me in the back of the head. Other times I’ve found a house loaded with weapons, ammo, bandages and gear, but no backpack in which to carry more than a handful of it. Or I’ve visited four buildings in a row and found nothing but the ineffective bow and arrow. These are some of my favourite rounds. More often – too often – I’ll find some manner of assault rifle and some manner of shotgun and that’s that. This is often true even when I head immediately towards certain high-percentage loot spots in search of the game’s best weaponry. Plunkbat is best when one round you’re a Ghillie-suited assassin and the next you’re a struggling nobody with a gun you’ve never seen before. When you aren’t at either extreme, the highs and lows of play can begin to even out and round after round can begin to blend together. 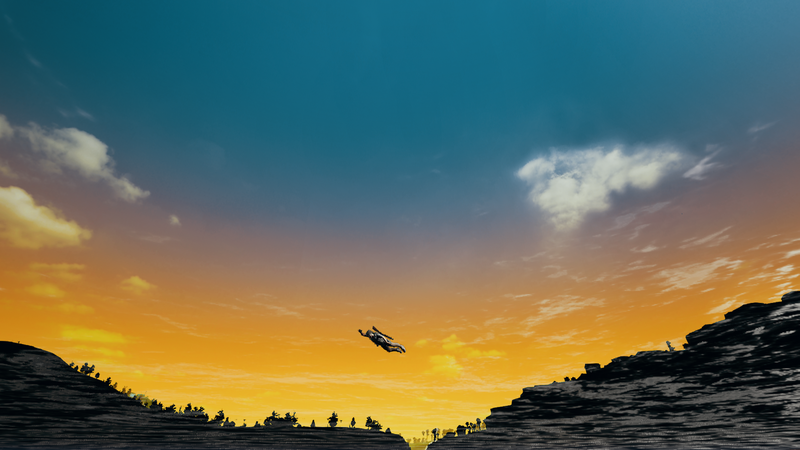 Thankfully a recent addition changes that and gives me hope for the long-term future of the game: shortly before release, a second map was added, Miramar. This is a desert map that from above looks superficially similar to its grassy sibling, but once you’re in among it you start to see how different it plays. For starters, there’s a lot less cover when you’re outside of the cities – no trees, fewer rocks, and smoother terrain. For another, those cities themselves contain taller buildings and the map overall provide more frequent vantage points for sniping down on the unfortunate souls below. 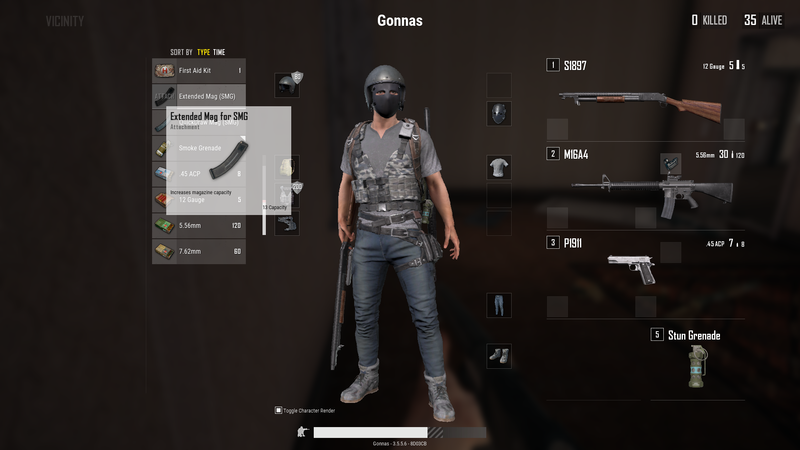 The result is that the aforementioned common pairing of an assault rifle and a shotgun goes from “I have most bases covered” to “I am hopelessly unprepared.” It doesn’t necessarily mean that you’re going to get sniped to bits the second you pop your head out from cover, but it does create the odd situation of seeing other players constantly that you have no meaningful way to engage with because they’re so far away. 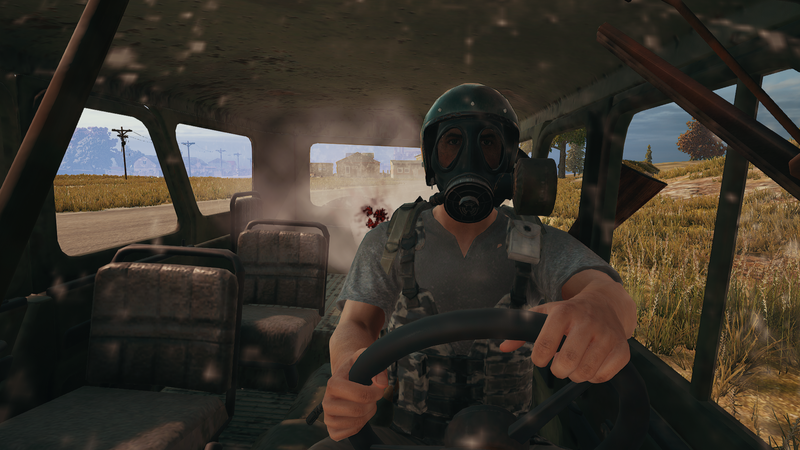 Back on Erangel, my buggy was chewing up the dirt until I was forced to hit the brakes as the terrain grew more rugged and dangerous. The painwall was gaining on me, visible now as a thin blue line on the game’s minimap. My heart was pounding. Would I make it? I’d come so far. I had to make it. The safe zone came within sight and I realised it was just on the other side of a final steep hill in front of me. I had visions of speeding up the hill, becoming airborne at its peak and flying triumphantly into safety on the other side. But the hill was steeper than I realised. I put my foot down but struggled to even reach the hill’s peak, the buggy slowing to a glacial crawl near its top, the wheels threatening to lose purchase. As I was twenty feet from safety, the wall approached… and overtook me. My health started to tick down, but then a few seconds later I reached the safezone. I was fine, relatively speaking. This might not be obvious if you haven’t played: the painwall is not a deathwall. It’ll take your health and kill you eventually, but slowly. Plunkbat carries many of the hallmarks of other survival shooters, but it’s surprisingly forgiving and accommodating. Sometimes that’s just because its inventory system is easy to use, so you never die while trying to work out how to apply a bandage. Sometimes it’s that you can connect so quickly to a new game after each failure that it’s as close to an instant reset button as multiplayer gaming has ever come. 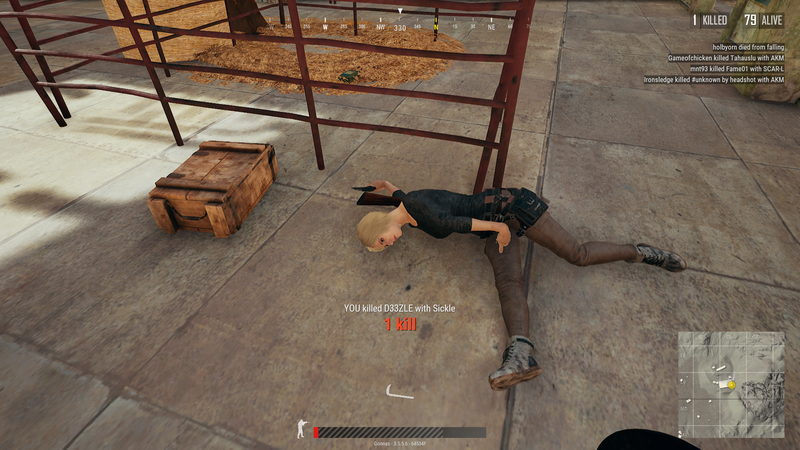 Sometimes it’s that you can parachute into a dumb place, fail to kill anyone, but still come out on top. Sat in my buggy atop that mountain, I was better than fine. My earlier scavenging at the edge of the world had left me with a good loadout, and now I was at the edge of a moderately sized play area with almost full health, a fast vehicle, and a couple of minutes before the circle began to shrink again. A few minutes earlier I had been facing an ignoble death, alone and unseen, and now I was in a strong position from which to advance into the match’s later stages. This is a simple story and the kind you’ll live regularly when playing, but it was also wholly thrilling. It was the kind of white knuckle escape I’ve played in countless scripted singleplayer games, but here it was more exciting for the way in which it developed out of the interplay between my choices and Plunkbat’s systems. Four minutes later, I was driving that buggy through a small village when I was shot and killed by an unseen enemy. 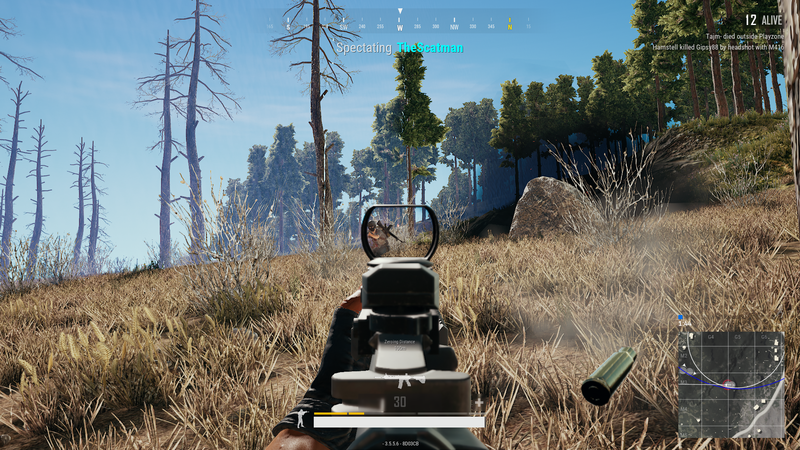 In the replay, I watched this person take aim and kill me in a single shot from a powerful rifle. It was impressive. Plunkbat’s systems read as simplistic when compared to other modern multiplayer games. There aren’t dozens of character classes with hundreds of interlocking skills. There is no AI director monitoring players to dole out excitement in set portions. Safe zones and bombing zones are randomly placed. But its loose grip upon player’s experiences means you’re more free to decide the kind of excitement you get from it. Back on the menu, I immediately hit the button to join another game. 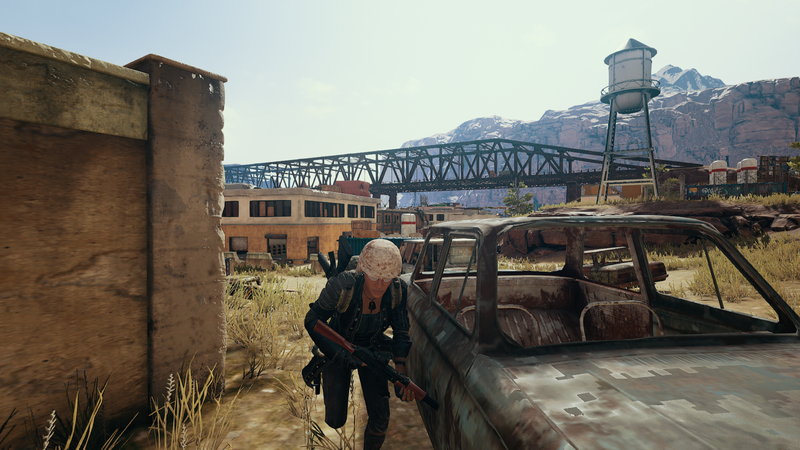 Playerunknown’s Battlegrounds is out now on Windows via Steam for £27/$30/€30.